Threat Intelligence is quickly becoming one of the most powerful ideas in our current IT security landscape. 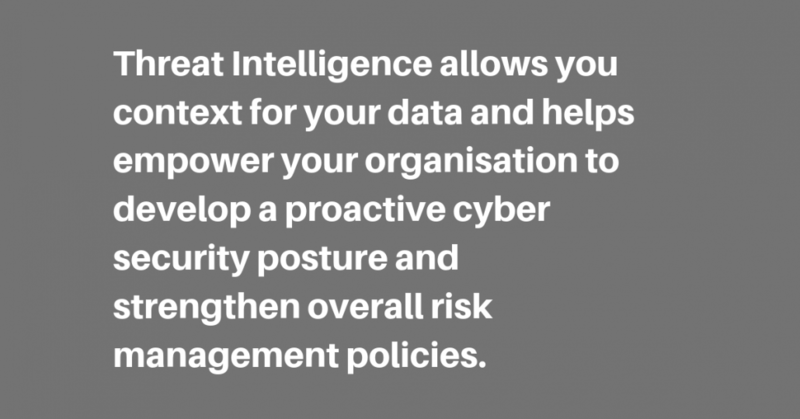 Threat Intelligence allows you context for your data and helps empower your organisation to develop a proactive cyber security posture and strengthen overall risk management policies. It also helps security teams make more informed decisions during and in the aftermath of cyber-attacks. So, you may already have a plethora of security products in place like Firewalls, Proxys and endpoint security, but are you able to see the big picture? With all of these security products logging back to your Security Information and Event Management (SIEM) it can come across as just noise. How can you evaluate if that IP address or domain is important to you? Your trusty SIEM is collecting data, but do you know what it’s collecting or how important it is? Maybe, you may have the SIEM using a lookup list so when it detects a bad IP it will alert you. Great, that’s a good start, but WHY is it a bad IP? Is it part of a larger attack? Is it just the beginning stages in the cyber kill chain? This is where context becomes key, linking into why Threat Intelligence is critical. What is a Threat Intelligence Platform (TIP) and why do you need one? Great, you now have a TIP, so what are your next steps? Automation. This will allow you to leverage the TIP to help make better informed decisions and then take action. In the above example I said that we saw a C2 URL in the proxy, and by using the TIP we have determined that it is malicious. Following this, and using automation, we can block said URL, either with or without human interaction. 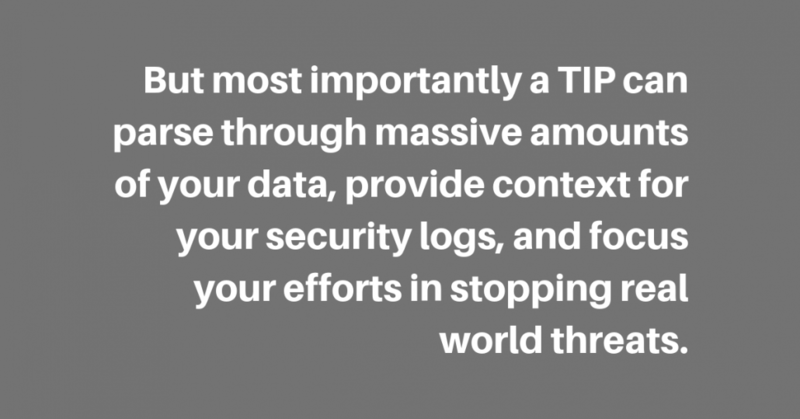 But most importantly a TIP can parse through massive amounts of your data, provide context for your security logs, and focus your efforts in stopping real world threats. Last but not the least, A TIP optimises response time and improves remediation, and reports strategic, operational and tactical intelligence to stakeholders.